27114 Gäste, 1345 Mitglieder online. Tranquil Landsberg is beautifully situated on the Lech river with a view of the Alps. Vespa and Lambretta are of course popular in the home of SIP. This stylish means of transport fits into the region where there is an appreciation of good things, from food to their choice of vehicle. Last Saturday though there was an end to the tranquillity and chilled cruising with elegant scooters from the 1960s for a few hours. The melody of racing engines over an industrial area to the north west of the town was audible from afar. The smell of high-performance two-stroke engines filled the air sweeter than the fragrance of Lech’s blossoming meadows and the atmosphere was charged with the sizzling excitement of the race. All caused by these classic scooters that you are happy to see in front of Landsberg’s ice cream parlours in the summer. It was showtime just outside the SIP Scootershop. 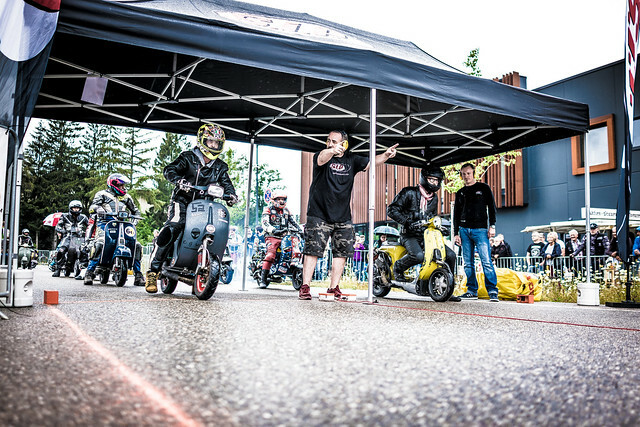 “Tacho Karacho”, a drag race just for geared scooters, took place in the middle of Landsberg for the first time. The fastest scooters from the German-speaking region had travelled here for this. The race was a championship race for the German “Deutsche Blechroller Meisterschaft – DBM” so a date that was not to be missed for any self-respecting tuner. Unfortunately, the only thing that didn’t care for the event was the weather. After weeks of sunshine, it had to rain again for the first time on precisely this Saturday. Despite the poor weather forecast, there were more than 500 visitors along the course. A really good number under these conditions. Unfortunately it rained lightly the whole morning until the race had to be interrupted for roughly half an hour in the early afternoon due to heavy rain. But then after the restart it remained dry until the end. Regrettably the damp conditions had had an impact on the number of riders. Only the experienced riders wanted to line up on the start line in the forecast continuous rain. Although this was enough for a very well filled starting field with good competitors, the organisers had hoped beforehand to be able to motivate lots of new starters to try their luck at the starting light. The conditions at the start of the race were then even a challenge for the riders’ skills. Many heats started with spectacular sliding or drifting. Luckily without any of the riders injuring themselves. 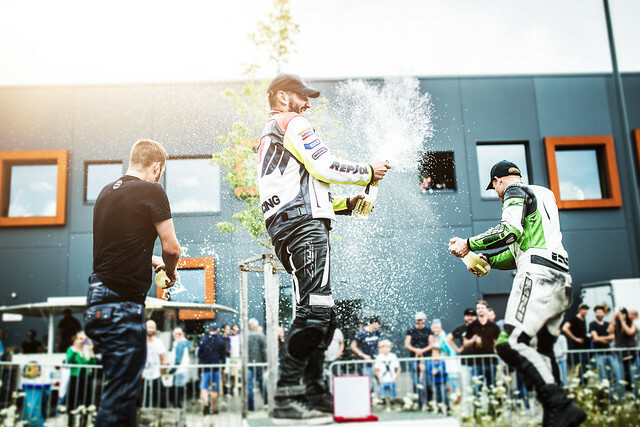 At the end of the day, the riders and spectators had experienced a first-class and thrilling race. 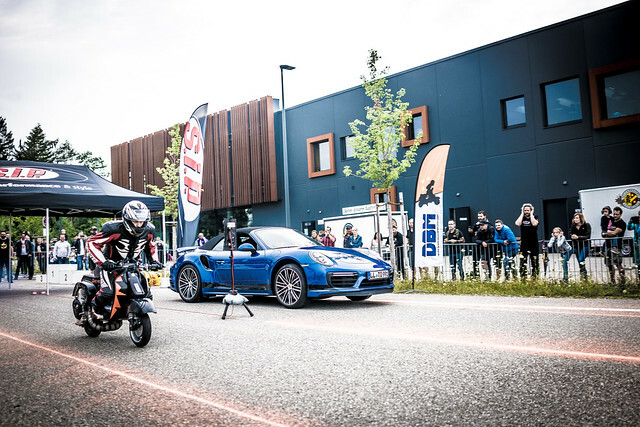 The accelerations achieved in the fast classes leave most sports bikes behind and a new German record was achieved with 6.7 seconds over 150 m. At the same time, the fastest speed after the short course was 132 km/h. Matthias Brugger took the crown that day. An event that calls for a rerun as sometimes they like things a bit tougher, faster and louder in Landsberg am Lech too. But then with Italian flair and style please. All pictures of SIP Tacho Karacho Quartermile can be found here on flickr. Here is our SIP TV Video of Tacho Karacho 2018. If you like it please like, share and subscribe to our YouTube Channel!